When you stay at White Caps in Bathsheba, you'll be on the beach, within a 15-minute drive of Bathsheba Beach and Huntes Gardens. Featured amenities include complimentary wired Internet access and laundry facilities. With a stay at St Lawrence Beach Condos - Seascape in St. Lawrence Gap, you'll be on the beach, within a 15-minute drive of Brownes Beach and St. Lawrence Bay. Free self parking is available onsite. A stay at BK Villas places you in the heart of Maxwell, a 5-minute drive from Maxwell Beach and 6 minutes from Turtle Beach. Free self parking is available onsite. 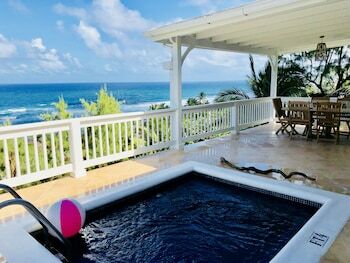 When you stay at this villa in Inch Marlowe, you'll be near the beach, within a 15-minute walk of Long Bay Beach and Silver Sands Beach. Free self parking is available onsite.